Maniac Mansion: Day of the Tentacle is a comedic point-and-click adventure. 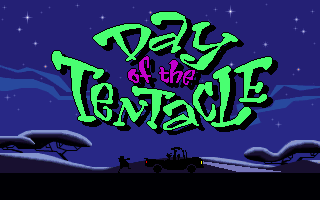 As the title suggests, it's a sequel to the original Maniac Mansion, which is fully playable here as an in-game bonus. While you do have to tie a noose and procure a diamond towards the end of the game, neither appears in your inventory as a discrete item. The credit for "Carol, Sunny & Rich" was expanded to "Sunny, Carol and Rich at The Lab". John Drake was added to the testers, who are listed alphabetically by first name. In the Macintosh version, Maniac Mansion is accessed by using Weird Ed's computer five times in a row, instead of once. 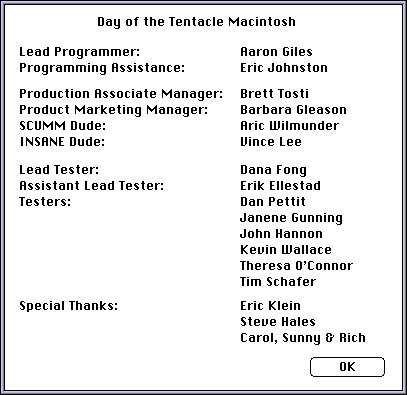 Programmer Aaron Giles explains, "Since Maniac Mansion had never been ported to the Mac before, and since we were on a fairly tight schedule for Day of the Tentacle and wanted to concentrate our testing on the primary game, we compromised by still including it, but making it a bit more of an easter egg than it was in the DOS version." This page was last modified on 1 January 2018, at 03:10.